WORLD CUP! The once-every-four-years fest of stadiums not being completed on time, FIFA corruption, corporate greed and hyper-zealous sponsors, dull substandard international football from tired irritable professional footballers, unfettered jingoism, and the world actually believing any of this still matters is finally here, and WE LOVE IT! I can’t help it. For all of my cynicism – and for those of you who don’t know, I am occasionally cynical – my inner ten-year-old leaps out and goes bananas in the build-up to the festival of football. It’s obviously nothing to do with the actual football, I barely remember the last decent bit of football I saw at a World Cup. As an afficionado of football kits and their traditions and trends I am constantly having angry palpitations over the stupid kit regulations and choices at the FIFA World Cup, in fact in global scheme of things very little annoys me more than the idea of Spain wearing red shorts (it’s just WRONG). I do intend, this weekend, to provide you with a long, detailed rant/overview of all of the kits for this year’s World Cup (and if you aren’t interested in my many annoyances about football kits, I might also advise you to unfollow me on Twitter until mid-July). But dspite all of this, I LOVE IT! Our Panini album is filling up fast, and I have most of my old ones going back to Mexico 86. The drawing at the top as one I did in 2010 during the South Africa tournament. 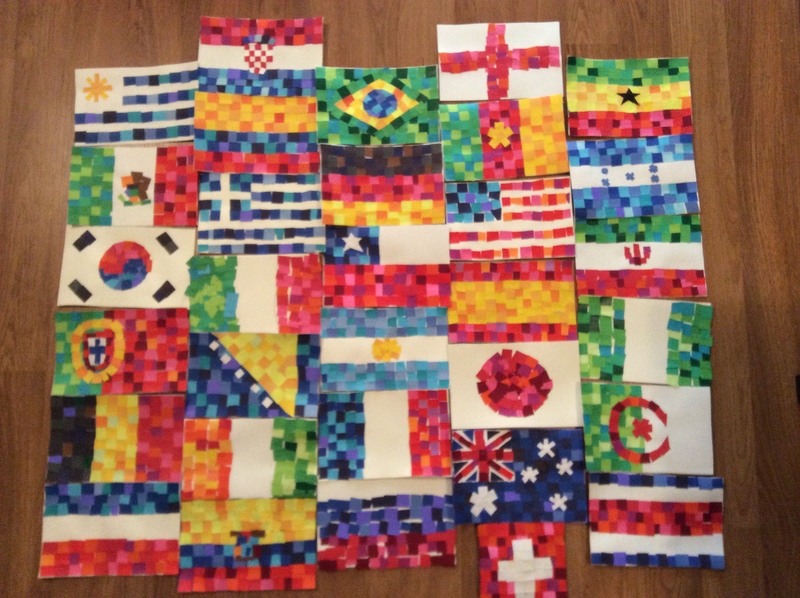 And above, flags of every country taking part, made out of paper mosaics by me and my son, this was a fun project. We’ll be putting them up around our house, maybe taking them down as teams get knocked out. The World Cup starts today, with Brazil vs Croatia. Most of the games will be on while I’m at work but I actually will get to see this one. And for the record, my prediction for the winning team this year is indeed… Brazil. ARGENTINAAAAAAAAAA!! 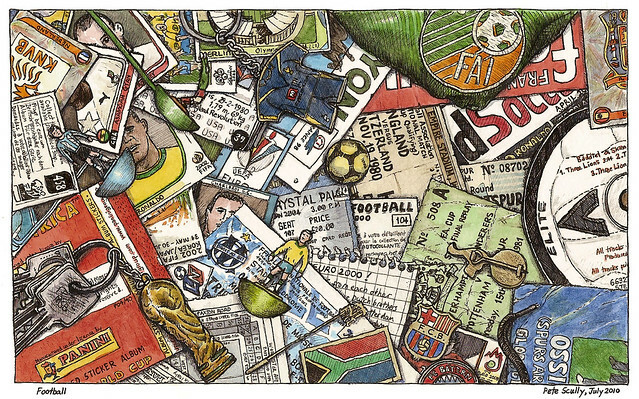 Love the Africa WC doodle btw! !